This is a classic Haute Route journey of 10 days (8 days of walking), taking you on an easterly high route, parallel with the main backbone of the European Alps, between the two ski resorts of Courmayeur, in Italy and Zermatt, in Switzerland. 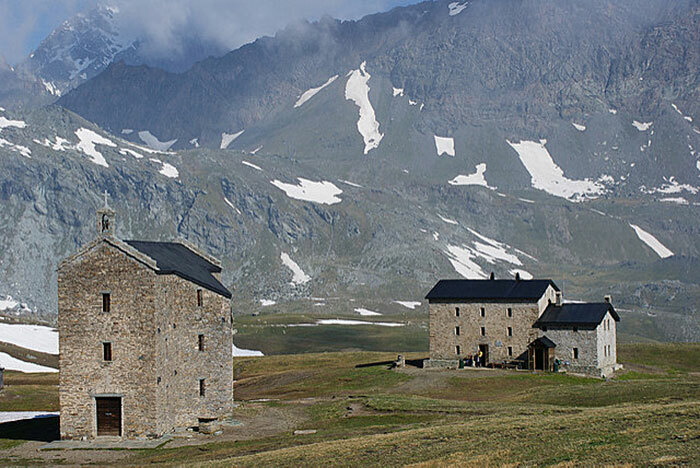 An overnight stay at the Grand Saint Bernard Pass, the traditional home of the St Bernard dogs and the monks who bred them, to find those, lost in the bad weather on the ‘Francigena Way’ – an ancient trade and transhumance route running from Canterbury (England) to Rome. Crossing Cols on the Grand Combin Tour and the Alta Via 1 and seeing summits such as Mont Velan (3,734 metres), Gran Testa di By (3,588 metres) both of which form part of the Italian/Swiss border. The trek between Oyace and the Val Tornenche (Cevinia) is a particularly remote area with many mountains over 3,000 metres that have glaciers hugging their northern aspects. The climb to the Theodulo Refuge. At 3,300 metres the Rifugio offering stunning views of the glaciers below and summits such as the Breithorn (west, 4,165 metres). Finally, there is the crossing of the Theodulo Glacier, over 3300 metres high, with stunning views of the Matterhorn, the Mont Rosa massif and the Grenz glacier on your journey into the Ski resort of Zermatt. Arrive at your hotel and meet your guide for the tour. The guide will give an overview of the tour, advise of the personal kit you will need and answer any questions you may have. You are then free to have a stroll around town, gaze up at the Mont Blanc massif and get dinner in any one of the resorts restaurants. Leaving Courmayeur, we walk out of the town passing through Villair and take the Val Sapin. This steady climb passes through pine forests and up onto the mountainside, passing an old log works to arrive at Col Sapin, where it is possible to see the Stella Alpina (Edelweiss) flowers. From here we drop into the Val Armina, with views of the Grande Jourras on the Mont Blanc Massif, before a short climb over another pass takes us down to dinner at the Rifugio Bonatti, named after the famous Italian Mountaineer, Walter Bonatti. 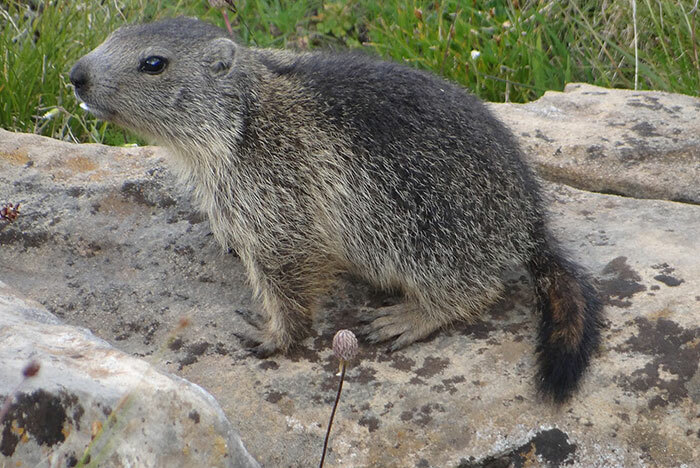 Distance: 17 kilometres, ascent 1,500 metres /descent 675 metres. After breakfast, during which you can view the summit of Mont Blanc (4,810 metres) we climb to the Colle Malatra (2,935m) and your last clear view of the Mont Blanc massif. We descend for 1.5 kilometres to the Lac du Merdeux. Nearby is the Rifugio Frassati and a short stop. A climb of 315 metres takes us over the Col Ceingles o de Saulie and we then descend for the next 5 kilometres to within sight of the Grand St Bernard Pass and Monastery. A short climb of 150 metres brings us to our hotel, next to the Monastery and Lake. Half board accommodation in Hotel. Distance: 19 Kilometres, 1,435 metres ascent/ 600 metres descent. This morning we pass around the Lago di Grand St Bernado. Our first summit of the day is the Tete de Barasson (2,731 metres) then Mont Paglieta. We are now following part of the Grand Combin trail, climbing a further 800 metres to cross the Col Champillion (2,732) before a short descent brings us to the hut for our overnight stay. Distance: 14 kilometres, 1335 metres ascent/ 1365 metres descent. We spend the morning descending the mountainside, through forests and some small picturesque settlements before arriving in the mountain village of Valpelline, home to Fontina cheese!. An easy climb through the Cote Ferret forest allows us to cross a torrent and an easy descent brings us down to the mountain village of Oyace, home of the Tornalla, an Octagonal tower or ‘Fortress,’ rumoured to have been built by invading Saracens. Don’t worry, we overnight in a hotel! Today we climb out of Val Pelline back up into the high mountains Col de Vessona (2788m) and the Col de Chalebay, passing below Mont Pisonet. 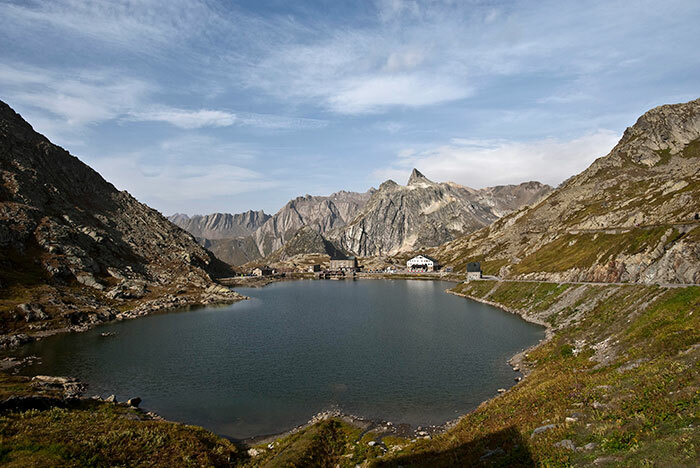 We overnight at the Rifugio Cuney, positioned between two Lakes and below the Becca du Merlo (3,237m). Distance: 14 kilometres, 1620m ascent / 250m descent. Today we are heading north, parallel to the spine of the Becca di Arbiere (3 main summits over 3,000 metre’s) to the Lac de Luseney. There is a climbers Bivacco (basic shelter) but no serviced hut, such is the remoteness of the area. 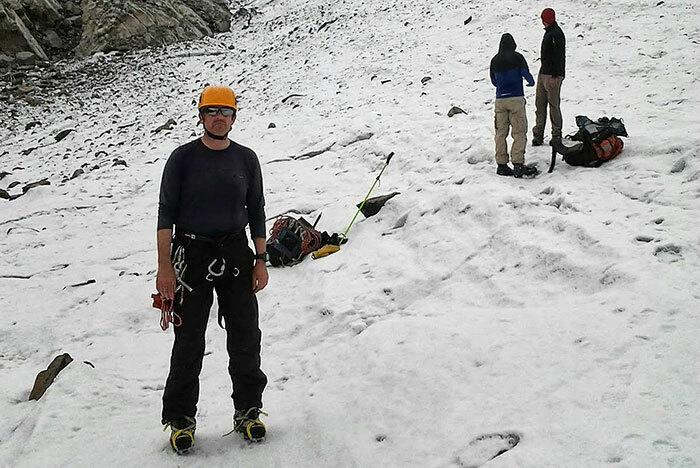 We climb to the Col de Fort, at just over 2,900 metres, descending the north side we pass the Roisetta Glacier. Finally, we descend to the Lac Cignana (2,150m) and the Rifugio Barmesse on it’s southern shore. Distance: 15.5 km, 1000m ascent / 1000m descent. Today we climb the pass of the Finesttra Cignana and then descend into the mountain ski resort of Breuil Cervinia. 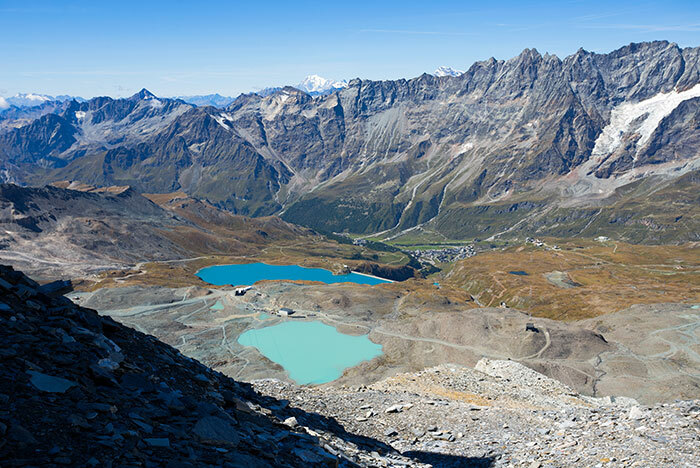 After lunch we have a 1,300 metre climb, above Lago Goillet up onto the edge of a glacier to arrive at our final hut, the Theodulo Rifugio, offering stunning surrounding views of the Breithorn and the Matterhorn and further afield some of the summits that make up the Monte Rosa massif. A truly spectacular finally dinning out on the ‘backbone’ of the Alps. Distance: 18 km, 1600m ascent / 360m descent. This morning we cross the Theodulo Glacier as we enter Switzerland. Stepping off the ice near the Gangedhutte (Swiss Refuge and coffee stop) you can view the Gornergrat Glacier and Mountain summits north of Dufourspitz (highest of the Monte Rosa Massif). From here we begin our descent to the mountain ski resort of Zermatt. After checking into the hotel there is time to explore the town before dinner. Distance: 14 km, 100m ascent / 1700m descent. The railway station, a short walk from the hotel, provides trains heading north down the Zermatt Valley, through more stunning scenery. Arriving in the Rhone Valley at Visp, you will find connecting Rail services to Geneva, Milan or Zurich. This walk is between 12-21 July 2019 and 26 July-4 August 2019. This trip is suitable for anyone who is a regular walker. You will need to carry a medium sized rucksack (a maximum of 30 Litres in size) and the total weight based on the kit list provided should not exceed 10 kilograms. How long will we be walking for each day? So if you are considering this journey and need to discuss your requirements, please feel free to contact us. We’ll arrange a chat on Skype to discuss your personal tour. Suitable for anyone who is a regular walker carrying a medium rucksack (max 30 litres). You'll spend 5-8 hours walking per day at a moderate walking pace.